Anawangin cove is a destination that welcomes both hikers and beach-lovers. If you love the outdoors, this little inlet facing the West Philippine Sea is for you. Perfectly situated at the sunshiny province of Zambales, this cove offers a respite from the madness of the metro, thanks to the absence of phone networks. Mt. Pundaquit, which serves as a jump-off to reach the cove on foot, offers a good challenge to hikers of all levels. The riverbed that leads to the cove is littered with agoho trees, providing ample shade from the sun. 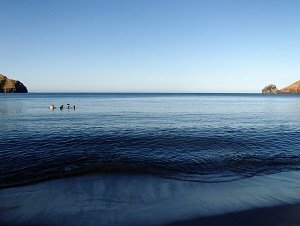 The calm and warm waters of the sea invite you to take a dip and reward yourself from the hike you just accomplished. When was the last time you had an actual conversation with anyone that did involve neither work nor looking at a small screen? If you cannot remember when, you will have plenty of opportunities here. Join in on the fun of the young boys skimboarding or that group happily throwing a Frisbee. Why not introduce yourself to the ladies casually playing volleyball or perhaps swap stories with the fisher-folks in the area? This is social networking, Anawanin-style. You can call it old school, we think of it as a necessary part of a digital detox. TRIPinas offers a wide variety of options to meet your needs. For those who wish to have a completely hassle-free trip, we can arrange for an all-in overnight package. 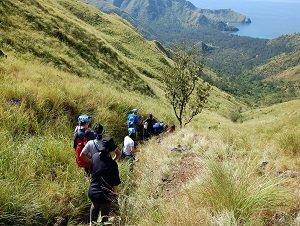 This option includes a roundtrip transfer from and to Metro Manila, hiking guide, boat for the island hopping, camp gears meals and all entrance fees. Of course, if you prefer to travel on your own (either with a bus or your private vehicle), that’s cool with us, too. We’ll be happy to re-compute the rates for you. You want to bring your own chow? That’s perfectly fine as well. We will remove the cost of the meals. Have your own tents/camping gears? Awesome! We’ll deduct it from the package cost. Bonus: we’ll even help you set-up your gears at no extra cost! Oh, you have only one day to do the entire trip? Don’t worry, we can also customize this to a day trip. Just let us know whether you want to go hiking + island hopping or just island hopping. We’re easy to talk to. With all these options, one thing is for sure: your safety and satisfaction are our top priorities. So come on board! 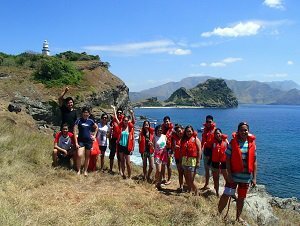 Php650/person - Starting point: Pundaquit, Zambales. Php1550/person - Starting point: Metro Manila. 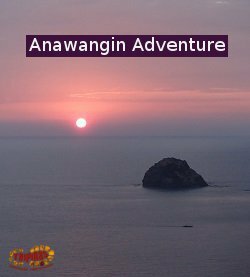 PM Swimming, sunset watching, stargazing..
WHAT TO DO IN ANAWANGIN? Your TRIPinas dispatcher will meet your group at one pick-up point in Metro Manila. After a thorough briefing, you will board your van and head to Brgy. Pundaquit in San Antonio, Zambales which will serve as the jump-off for your day-hike. Upon reaching the jump-off, we suggest that you divide your things into two categories: those that you will need for the trek to Mt. Pundaquit (small backpack with trail water and food, sun protection) and those that will be used at the camp/beach (e.g. swimwear, extra clothes, etc.). Place the latter in a water-proof bag/duffel because they will travel on a boat together with our camp staff who will be in-charge of the rented camp gears and your pre-ordered meals. We strongly suggest that you start your hike as early as possible (not later than 5AM) as the heat can be oppressive on the trail. Hiking lasts about four hours and there is no water source in between the jump-off and Anawangin beach. You will follow the path of a dry riverbed so expect it to be rocky. We highly recommend that you bring a hiking stick with you. There will be some quick to eat and hydrate. Once you have a panoramic view of the cove from the top, you are about 1.5 hours away from the beach. Continue to descend until you reach the shore. You will be welcomed to the camp site by towering agoho trees. By the time you arrive on camp, your tents are already set-up and lunch is ready. After a hearty meal, you can have a siesta to recover from the walk. As it can be warm in the tent, you can prop your hammock between talisay trees or lay down a mat on the sand and snooze under the shade of the trees. Once the afternoon heat has subsided, head out to the water and swim your heart out. The shoreline is long enough to throw some Frisbees or play volleyball. Too tired to move? Bring out your deck of cards and play poker, etc. While you are having fun, our staff is busy preparing your dinner. Around 6PM, we'll call the team for supper. We usually rest around 8PM. Wake-up call the following day is around 6AM but if you want to witness the sunrise, we can go with you to the view point at around 5AM. Breakfast is at 7AM after which, you can continue to do you water activities. Make sure that you have packed all your belongings by 9AM in time for the boat pick-up for the group island hopping to Camara and Capones Island. Depending on the wave conditions, the boat will dock and you can explore both islands. The entire island hopping activity will take about 2 hours. By 11AM, you will be back at the jump-off. There are some basic paid shower facilities that you can use so you can rinse off before leaving for Manila. At 12 noon, you will board the van. There will be a 1-hr lunch break (meals on your account) at Subic after which you will continue to travel to Manila where our driver will drop you off at the same point where you were picked-up the day before. ❶ Where is it? It is a cove situated at Brgy. Pundaquit, San Antonio in Zambales that is roughly a four-hour drive from Manila. There are also public buses that service this route making the jump-off point highly accessible. ❷ What activities can we do there? A lot! It's a popular hiking, swimming and camping destination. We love the idea that after a half-day of hiking, you get to chill on your hammock making s'mores and sharing funny stories with your best buds as you watch sun set on the horizon with the West Philippine Sea as the back drop. ❸ Are there hotels/inns there? For the moment there is none, but you can set-up your tent or hammock and stay overnight for a fee. ❹ How about phone networks? 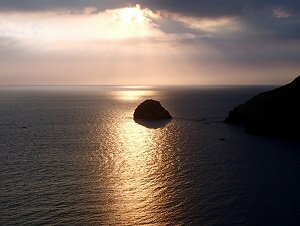 There is no phone network service at the cove (no calls, no texts, no wifi). There is also no power in the cove - we highly recommend that you bring your personal power bank to add juice to your gadgets or just enjoy the electronic detox the isolation gives you. ❺ Are there ATM's? As there are no phone networks, there are no ATM's. Make sure to bring enough cash for your daily expenses or bring everything you think you need from your point of origin. ❻ We don't want to bring food, can we buy it on-site? There is a public market at the poblacion (municipal center) where you can source your food from. As an alternative, you can also pre-order from us and we'll take care of your meals. At a minimal cost, this will cover your lunch and dinner for the first day and your breakfast for the second day. We will provide your dining kit (plate, spoon/fork, cup) as well. The menu will depend on what's available in the market but we guarantee that they are all fresh and delicious home-cooked meals. We can also prepare diet-specific meals (e.g. vegetarian, halal). ❼ Can we bring our dogs? We love having pets around! As a courtesy to other travelers, make sure that your dog is vaccinated and potty-trained. If you plan on having your canine friend during the trek, you may want to build up his endurance first as the heat in all Zambales mountains can be daunting for dogs. Bring a leash to help him navigate narrow paths and a life vest for the boat ride on the return. Don't forget your dog's sleeping mattress/blanket, too for his sleeping area inside the tent. ❽ My grandma/grandpa wants to go, too! Is that possible? 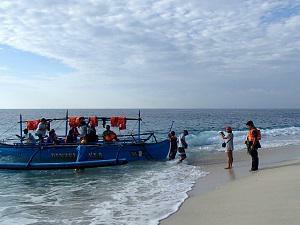 The hiking part may not be the best for them so we suggest that they go to Anawangin cove via boat ride. They do need to be aware that creature comforts are very limited at the cove (e.g. no hotel rooms). ❾ Is this trip kid-friendly? We require that a child be at least 6 years of age and to be accompanied by a parent or a legal guardian.